A traditional gospel song with uncertain origins, but here it works as a transitional piece of acceptance in between two songs of hurt and spite. There's very little ambiguity on this, except for the style it's performed in: for whatever reason Dylan chose a reggae groove, he did, and it is not only remarkable in it's oddness but also in it's brilliance. It's hard to describe, as there's nothing else in his catalog quite like this. He did do some pseudo-reggae on his classic 1983 album "Infidels", and in a few other places, but nowhere near as blatant as on this. While 'Precious Memories' is a gospel song and can be seen as another affirmation of his faith, Jesus is never mentioned, nor any dogma of any kind. 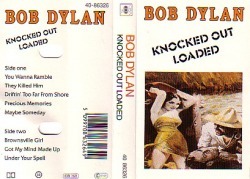 I see it as more of a detour on "Knocked Out Loaded", a moment of bittersweet reflection, also belied by the music (see 'You Wanna Ramble' for another such innovation). And it must be said that Dylan has never sounded better as a vocalist than he does throughout this album. "...Maybe someday you'll remember what you felt/ When there was blood on the moon in the cotton belt/When both of us baby were going though some sort of a test/ Neither one of us could do what we do best/I should have known better baby I should have called your bluff/ I guess I was too off the handle, not sentimental enough". Only Bob Dylan could write these lyrics without coming off as pompous, and actually, in the end, sounding humbled and pleading. 'Maybe Someday' is merely another counterpoint, another detour on this highway. With a song like this, how can anyone dismiss "Knocked Out Loaded"? Was this track accidentally left off some pressings?? (Just kidding).